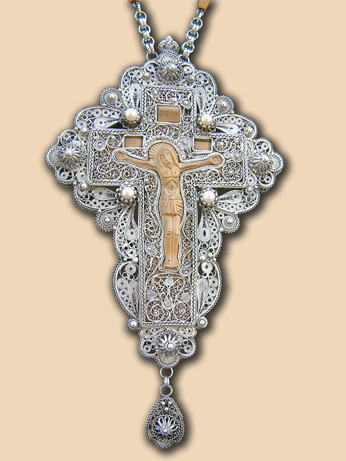 Pectoral cross with miniature wood-carving and natural pearls. Material: silver 950, box-wood, natural pearls. Technique: filigree, granulation, stone setting, woodcarving (unknown Russian author). 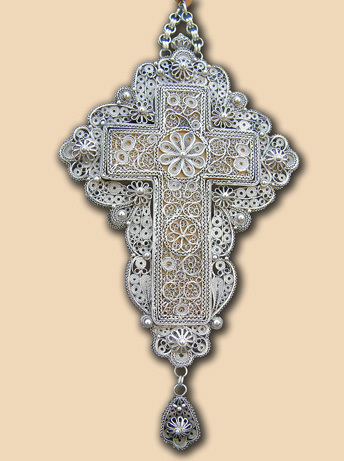 Size: cross 8×17 cm, chain 120 cm. Weight: cross 210 grams, chain 30 grams. Commissioned by: Father Gerasimos (Krstic), Archimandrite of Zica Monastery. In possession of : Father Gerasimos (Krstic), Archimandrite of Zica Monastery.